mSATA Flashdisk Solid-State Storage - up to 64GB capacity! Install a MLC or SLC mSATA flashdisk module onto any of our Atlas or Hercules III single board computers for rugged, lightweight, solid-state mass storage. 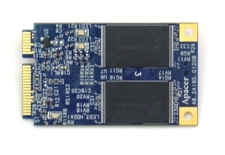 The flashdisk module works just like a SATA disk drive and requires no drivers. It provides high-speed nonvolatile mass storage in capacities of 8GB to 64GB. The flashdisk mounts on a mSATA connector and is held in place with two spacers and screws (included). It operates over -40ºC to +85ºC.